A decade ago, strength coaches and athletic trainers would have looked quizzically at a 36-inch long cylindrical piece of foam and wondered, "What is that for?" 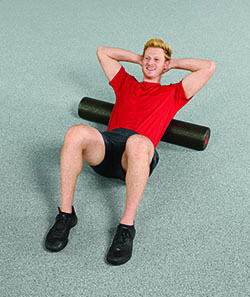 Today, nearly every athletic training room and most strength and conditioning facilities contain an array of foam rollers of different lengths and consistencies. National Academy of Sports Medicine (www.nasm.org) President Michael Clark, DPT, MS, PT, NASM-PES, is credited by many-this author included-with exposing the sports medicine community to the foam roller. In one of Clark's early manuals, he included a few photos of self-myofascial release using a foam roller. The technique illustrated was simple and self-explanatory: Get a foam roller and use your bodyweight to apply pressure to sore spots. Since then, many of us have discovered more uses for foam rollers, including injury prevention and performance enhancement. We've also moved away from the accupressure concept and now use them more for self-massage. And we've come up with specific protocols for different situations. Essentially, foam rollers are the poor man's massage therapist. They provide soft tissue work to the masses in any setting. But you need to know their nuances to get the most out of them. The application techniques are simple. Clarke's initial recommendation was based on an accupressure concept, in which pressure is placed on specific surfaces of the body. Athletes were instructed to use the roller to apply pressure to sensitive areas in their muscles-sometimes called trigger points, knots, or areas of increased muscle density. The idea was to allow athletes to apply pressure to injury-prone areas themselves. The use of foam rollers has progressed in many circles from an accupressure approach to self-massage, which I've found to be more effective. The roller is now usually used to apply longer more sweeping strokes to the long muscle groups like the calves, adductors, and quadriceps, and small directed force to areas like the TFL, hip rotators, and glute medius. Although I primarily use the rollers for athletes' legs, they can also be used with upper extremities. The same techniques can be used for pecs, lats, and rotator cuffs, although with a much smaller amplitude-making the movements closer to accupressure. I also judge whether foam rolling is working by monitoring compliance. If I don't have to tell athletes to get out the foam roller before a workout, I know the techniques are working. Most do it without prompting as they see the benefits. The question often arises: "Which is better, massage therapy or a foam roller?" To me the answer is obvious: Hands-on work is better than foam. Hands are directly connected to the brain and can feel. A foam roller cannot feel. If cost was not an issue I would have a team of massage therapists on call for my athletes at all times. World famous strength and conditioning coach Mike Boyle is Director of Elite Conditioning in Boston, MA. He is author of numerous videos and books and a featured speaker at seminars throughout the U.S, including Perform Better "Learn By Doing" Functional Training Seminars.